If you have missing or broken teeth one of the solutions is to have dental implants which are an effective way to permanently replace missing teeth with ones that look just as natural. Implant-supported dentures are also a very common procedure for stabilising removable dentures, which is a welcome solution for denture-wearers. At Exquisite Smiles Dr Rajeev Bhandare is able to provide a range of dental implants and will discuss the procedure that is best for your oral health. Implants range from replacing a single tooth or several and supporting full or partial dentures. All on 4 is an innovative surgical technique which allows four implants to support one full arch of teeth. This is a solution for patients who have very damaged teeth, or who have lost or are losing teeth due to decay or gum disease. One of the advantages with the All on 4 technique is that it is a quick way to fully replace dentures with natural-looking teeth. Dental implants are used as an alternative to dentures and bridges because they are non-invasive to your existing teeth. 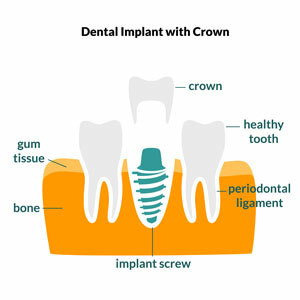 Dental implants are artificial titanium tooth roots that support the false teeth, such as a crown or bridge. Each implant is placed into the bone where it functions similarly to a natural tooth root. Once healing and new development have occurred, the fixed tooth can be attached. Dental implants are an excellent option for long-term smile restoration. Give us a call if you’re concerned about missing teeth and want to discuss which options are available.